EQ4PM: Applied EQ #6: What are emotions? Before we get very far into the business of applying emotional intelligence, it may make sense to define emotions. I like to keep things simple whenever possible. My mentor, Rich Blue, uses the acronym SASHET to represent the following 6 emotional families: Scared, Angry Sad, Happy, Excited, and Tender. 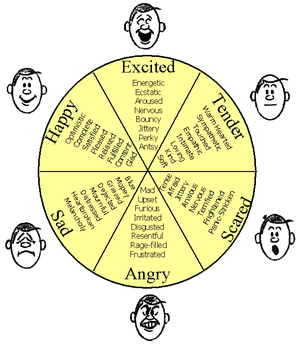 Rich contends that those 6 families of emotions contain all the range of possible emotions. There are 3 positive emotional families (Happy, Excited, and Tender) and 3 negative emotional families (Sad, Angry, and Sad). Within each of these families, you will find most common emotions. For example, Angry includes frustrated, irritated, upset, mad, and resentful. Based on that acronym, I created the diagram at left which shows each of the families and all the nuances of that family of emotions. It is usually most important to know what family of emotions I am experiencing and less important to know the degree to which I am feeling it. For example, the emotions within the family of Happy range from pleased to glad to optimistic. It is simpler to just recognize happy than to try and pinpoint how happy we are. I like the SASHET acronym and the model. Others may use more or less emotions; I try not to get hung up on that. Daniel Goleman, for example, includes confidence, disgust, and surprise as emotions. I don’t find this helpful; if you do, please use them. I find the family of 6 feelings sufficient to address the needs of applying emotional intelligence to project management.